A plea for both fiscal & monetary austerity! Still, three important developments may lift the economy despite the Fed, forcing it to taper its bond purchases and allow the recovery to accelerate. First, the Jan. 2 tax bill removed the risk of tax rate increases—on income, dividends, estates and the alternative minimum tax—that depressed growth in 2010-12. Second, most businesses are encouraged by the sequester and the idea of the government tackling spending, however clumsily. Third, private credit has started to grow, helped by thousands of new nonbank lenders. Total credit grew at a 5.6% annual rate in the fourth quarter of 2012 after contracting for much of 2009-12. But whether the economy turns up or not, it should be clear that the Fed’s unprecedented and far-reaching monetary policy has been a drag, not a stimulus. The charts below compare the US and Eurozone . The first shows how the Fed has done a better job at getting the ‘recovery’ going. QE1 in March 2009 was ‘trend reversing’. In April (and June) 2011 the ECB thought it wise to increase rates! 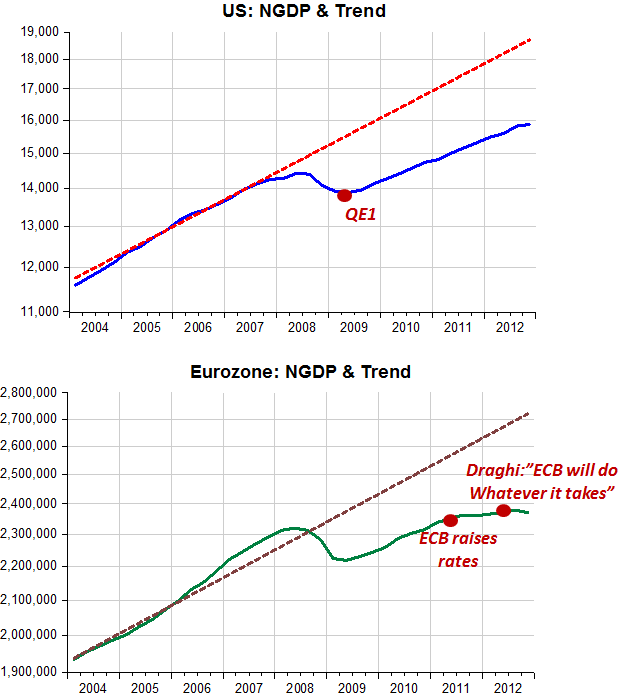 And Draghi´s July 2012 “ECB will do whatever it takes” has not been a ‘game changer’. The next chart provides a clear indication that the ‘debt problem’ that has been a topic of hot discussion is really a monetary policy problem. 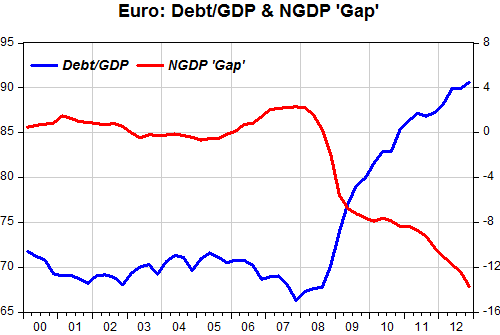 So it´s not a question that fiscal ‘austerity’ is needed to reduce debt and raise output growth. 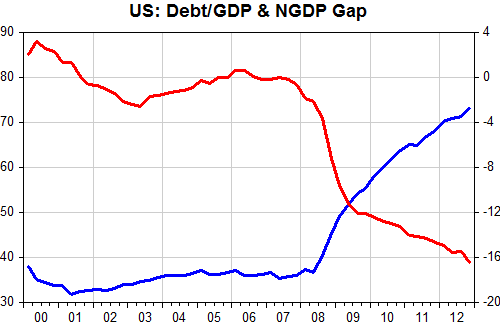 It´s really a question about ‘improving’ monetary policy to get both growth up and debt down. The CEOs I interview each week for my Corner Office series offer regular reminders of the power of simplicity. In last week’s interview with Brad Garlinghouse, the CEO of YouSendit, he described the new cultural values that he helped develop after he was brought in to help turn the company around. It’s a short and punchy list – “Be in. Be Real. Be Bold.” – and it’s memorable. “‘Be in’ is all about passion. Life is short. There are so many interesting things we can do in our life, and I feel like if someone is just kind of showing up, it’s not worth it for them or for us. “The second value, ‘be real,’ is really about being authentic in our communication. I have seen different cultures in my career that I felt had atrophied and needed revitalization, and they were the ones where you just didn’t feel like people were being real in terms of their communication. You’d sit in a meeting and work through something and think you got somewhere, and then you walk out of the room and someone’s putting the parking brake on and you don’t even know they’re doing that. The repetition of “be” helps make it stick, but so does the fact that there are only three values. It seems to be the sweet spot for what our brain can remember day-to-day. If a company has eight values, can the employees really be expected to remember them all? Think about a time you had to make a quick run to the grocery store – if you have to pick up eight things, it’s a good bet you’ll be reaching for a scrap of paper to make a list before you head out the door. Choosing an NGDP-Level Target fits like a custom-made glove! While fiscal policy has many roles, including providing a ‘friendly’ supply-side environment to maximize long-run growth potential. And if one tries to apply fiscal policy for stabilization purposes it will be ‘distracted’ from it´s important functions and likely cause ‘trouble’. There is a name for this rule-based approach to monetary policy: nominal-GDP targeting. It would keep nominal spending stable while also adding more long-run certainty to the nominal incomes of households and firms. Additionally, with this approach, the Fed’s balance sheet would not be blown up by ad hoc large-scale asset-purchase programs. The Fed’s failure to adopt something like a nominal-GDP target in 2008 meant that the central bank would not be able to adequately respond to the subsequent money-demand shocks that arose over the next four years. That is, the Fed’s inaction allowed the pernicious low-interest-rate environment to develop. So while the Fed did not directly cause the low-interest-rate environment, our central bank allowed it and all of its associated problems to emerge. For that it should be blamed. Interesting because I thought this was ‘common knowledge’. I myself had written on it almost five years ago and it´s included in the first part of Chapter 6 in my book with Benjamin Cole. The best summary was given by Russell Roberts of GMU in an October 2008 WSJ op-ed aptly entitled: “How Government Stoked the Mania”. The Community Reinvestment Act (CRA) did the same thing with traditional banks. It encouraged banks to serve two masters — their bottom line and the so-called common good. First passed in 1977, the CRA was “strengthened” in 1995, causing an increase of 80% in the number of bank loans going to low- and moderate-income families. It was certainly not due to Greenspan´s notoriously famous “rates too low for too long” seven years later! Not to leave any doubts, my view is that monetary policy in 2001-03 was ‘too tight‘. No money should go in through that door! Yesterday Neil Irwin got some criticism for not mentioning the fact that fiscal retrenchment wasn´t having all the expected contractionary effects on the economy largely because monetary policy was offsetting it. In fact, he was ‘reasoning from a GDP components change’, which obviously got him nowhere. The U.S. economy, as I wrote yesterday, seems to be holding up well despite the onset of fiscal austerity. Jared Bernstein, Scott Sumner and Ezra say I should have mentioned an important reason: the apparent success of the Federal Reserve’s policies, introduced last September, of pumping more money into the economy and pledging to keep rates low even after the economy improves. There is good reason to think that monetary easing is doing quite a bit of the work offsetting tighter fiscal policy. The Fed’s policies, including buying $85 billion in bonds each month with newly created money, are directly aimed at housing; $40 billion of those purchases are of mortgage-backed securities, meaning the money is being funneled directly toward the sector. And sure enough, a solidifying housing market is an important part of the economy’s holding up. And a second important consequence of Fed easing is to boost the prices of other financial assets, including the stock market. This isn’t rocket science: The Fed in September introduced a policy meant to boost housing and stock prices, and now, nine months later, housing prices and stock prices have risen quite a bit. Enough, indeed, to (so far) offset the impact of higher taxes that went into effect Jan. 1 and federal spending cuts that took effect March 1. So far so good. The bad news, though, is that these channels through which monetary policy affects the economy tend to offer the most direct benefits to those who already have high incomes and high levels of wealth. 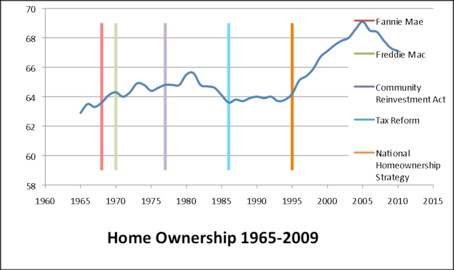 No matter that about 65% of households are homeowners and that many believe that ‘housing is the business cycle’. Mr Irwin disregards all indirect and spillover effects because he´s not comfortable with the ‘door through which money first goes through’! So far, the results of these activist central banks have fallen short of expectations. Maybe the ‘boldness’ is misdirected, concentrating on the interest rate-credit channel. In that case, the specification of an alternative target could be helpful! In a column last week I criticized Paul Krugman’s apparent belief that people who disagree with him — let’s say about half the country — are knaves, fools or sociopaths. I said his disdain was not just absurd but also politically counterproductive. Krugman responded to my “screed,” as he called it. His main point was that the disagreement over fiscal stimulus isn’t really a political disagreement at all. On one side, you have people who accept some simple, uncontested facts; and on the other, you have people too knavish, stupid or sociopathic to understand when those facts are patiently explained to them. To keep the fish that they carried on long journeys lively and fresh, sea captains used to introduce an eel into the barrel. In the economics profession, Milton Friedman is that eel. So Solow´s take on Friedman is also very much influenced by Samuelson´s antagonism to the man! And it must be said that there were some serious questions about his intellectual honesty when he was speaking to the mass public. From what I think I know, monetary policy remained very tight for most of this period while fiscal policy was extremely expansionary. From the outcome it is hard to say fiscal policy was in any way effective. From a monetarist standpoint it would be surprising if it were because monetary policy was simply neutralizing it! Unfortunately for him, unlike Friedman he´s charmless! I read your post on Samuelson and Solow and I think you missed the point about Samuelson’s “eel” comment. Samuelson was showing Friedman the ultimate respect: it was not a sneer. Later, it’s true, Samuelson sneered, but not, as far as I know, while Milton was alive. Given the time (1969) and place (Newsweek Column opposite Friedman), who else could PS be reffering to? My sense is that Mike and his allies believe that only those who see the financial crisis as an indictment of U.S. capitalism ought to be taken seriously. This view has gained credence on the center-left, and it has helped foster an intellectual resurgence among more radical critics of U.S. political economy. I suspect that this is why Mike has devoted considerable energy to arguing against the “market monetarist” interpretation of the crisis and the post-crisis malaise — he seems to recognize that if the market monetarists are right, the Great Recession is better understood, in Robert Hetzel’s words, as a reflection of monetary disorder and not market disorder. Whereas most conservatives have struggled to find a post-crisis narrative, market monetarism, like the supply-side thinking of the late 1970s, gives center-right thinkers a “non-zero-sum” economic narrative. If one embraces the market monetarist thesis, one needn’t maintain that the only road to recovery is to endure high unemployment as we work our way through a skills mismatch. Rather, what we need is for the central bank to keep nominal output growing at a steady rate, as this will allow entrepreneurs, investors, and workers to make decisions about the future with confidence. There are, of course, conservative reformers who reject the market monetarist thesis, but I would argue that they are in a tougher position intellectually than those who do. One should be very concerned about the future of most European countries. They may enter into a long-run period of stagnation, characterized by institutional rigidities, economic instability, and poor economic performance. In addition to the financial, economic, and debt crises, it is now common to speak of a “euro crisis.” In principle, there ought not to be a euro crisis, since there is no reason to say that there is a monetary crisis just because some countries belonging to the eurozone have debt problems . Those problems ought to be solved mainly by reducing public expenditures. The present crisis is not a European monetary problem at all, but rather a debt problem in some countries—Greece, Spain and some others—that happen to be members of the euro zone. Specifically, these are public-debt problems, stemming from bad budget management by their governments. But there is no logical link between these countries’ fiscal situations and the functioning of the euro system. The chart below paints the opposite picture, indicating the crisis is not a debt crisis, but one who´s origins are monetary. As Lars mentioned today, the OECD reports recognizes the monetary nature of the problem. Last year I said the Economic Report of the President (ERP) “lacked character”. This year I looked out for it in February but delays in voting the budget delayed the 2013 ERP, which was released in March. I had completely forgotten about it and my memory lapse wasn’t helped by the absence of notice and comments at the time of the release. For some reason I thought about it today. Wish I hadn´t because right in Chapter 2 (The year in review and the years ahead) I labeled it a “misleading” ERP. Private-sector job growth during the current recovery has been roughly comparable with that in the 1991 recovery and noticeably faster than in the 2001 recovery, as illustrated in Figure 2-3. As is typical, the recovery in hiring since 2009 lagged the recovery in output. Private nonfarm payrolls in the current recovery began growing 9 months after the business cycle trough. By comparison, payrolls first began expanding consistently 12 months into the 1990–91 recovery, and sustained private-sector job growth in the 2001 recovery did not begin until 21 months after the official end date of the recession. 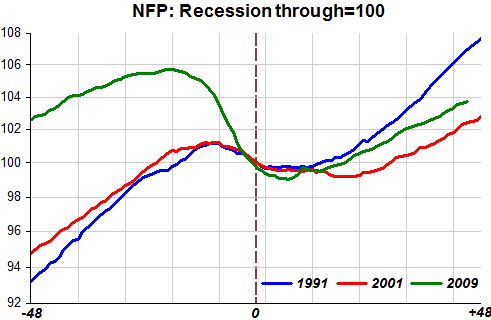 Thus, although the 2007–09 recession lasted longer and led to deeper job losses than did the recessions of 1990–91 and 2001, recovery in the labor market began somewhat sooner. Figure 2-3 is a version of the chart below, where NFP is Non-Farm Payroll and includes public sector jobs. The data are normalized to 100 at the through of each cycle and economists at the CEA focused on private-sector jobs because it gives rise to a “better” story. What´s misleading about the chart is that the reader is subtly prodded to look only at the recovery because that allows the CEA to spin a better tale. A better ‘geometry’ of this recession is given by the set of charts below. The first sets out the overall landscape, showing how closely nominal spending (NGDP) ‘hugged’ the trend over the years. 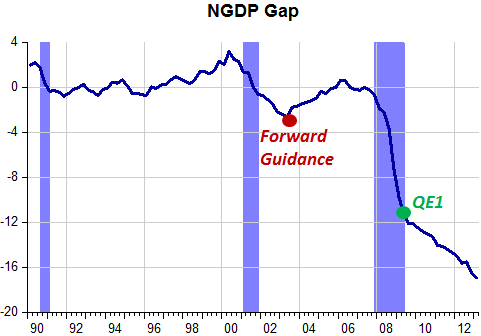 In the 1990 cycle NGDP fell back to trend and then kept growing at the trend rate (Gap=0). After mid-1998 the Fed allowed NGDP to grow above trend and when they tried to bring it back to trend they undershot significantly, becoming surprised that low rates were not helping bring the economy back to trend. The introduction of ‘forward guidance’ in mid-2003 ‘solved’ the problem. In March 2009, QE1 was only ‘good enough’ to break the speed of the fall relative to the trend level. The next chart illustrates the close association between what´s happening to NGDP and overall employment (NFP). The NFP data is normalized to 100 at the cycle peak while the horizontal axis shows the number of quarters employment took to regain the cycle peak level. NGDP for each cycle extends up to the quarter employment regained the previous peak. In the 1990/91 cycle decelerates enough to return to trend and from then on evolves very close to the trend level, growing close to the 5.5% trend growth rate. Employment falls only a little and quickly regains the previous peak. In the 2001 cycle NGDP decelerates too much, bringing spending far below trend. Employment drops by more than in the previous cycle and remains ‘depressed’ until NGDP starts rising back to trend once the FOMC adopted ‘forward guidance’. 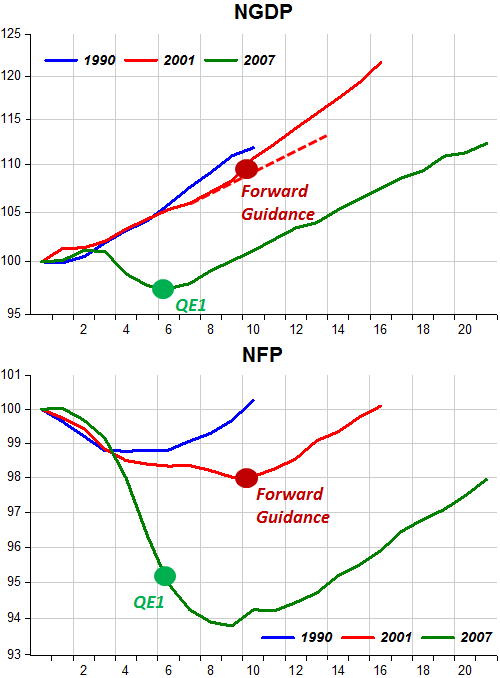 In the ongoing cycle, NGDP falls way below trend and QE1 was just sufficient to brake the fall. NGDP rises but grows below the trend growth rate, continuing to distance itself from the trend level. Employment recovers very slowly, remaining far below the previous peak almost four years after the start of the ‘recovery’. Does fiscal stimulus have the same ‘explanatory power’ as monetary policy (NGDP)? 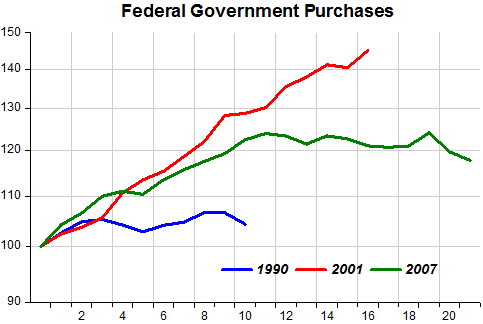 The next chart shows the behavior of one measure of fiscal stimulus – Federal Government Consumption & Gross Investment (Government Purchases) – during the cycles. Note that the 2001 cycle had the strongest expansion of Government Purchases. That didn´t help much, with the economy only gaining traction and employment rising after monetary policy became more expansionary with forward guidance.